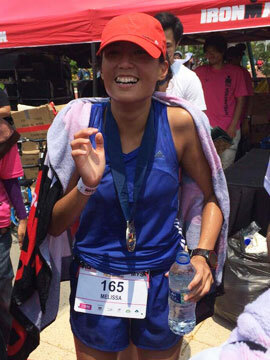 Run, Dance AND Party At THE MUSIC RUN™ By AIA | JustRunLah! 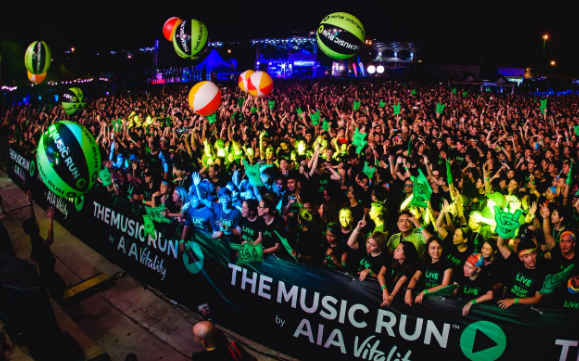 The Music Run™ by AIA 2017 – hailed in other countries as the Ultimate 5k Running and Music Festival, is returning to Sentosa Island on 6th May 2017, bigger and bolder this year in its third year running. 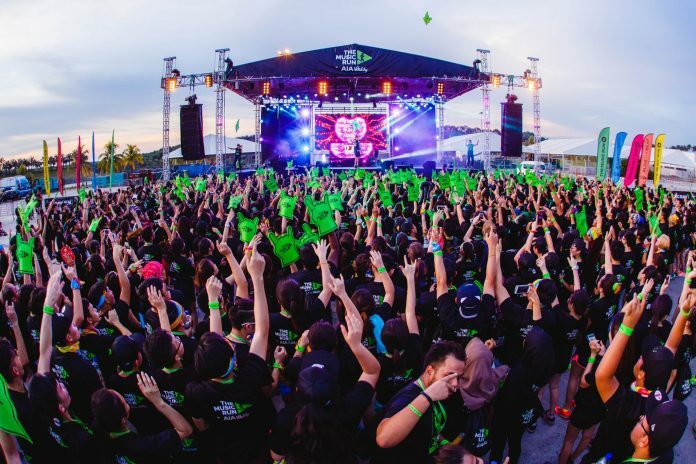 A phenomenal and futuristic run, The Music Run™is an award-winning event that offers a unique total music immersion experience and has been making waves all over the world, including multiple sold-out events in Asia in 2016 and new tour dates announced in India, Europe and South Africa this year. This year’s edition of The Music Run™ by AIA is set to be an upgrade from 2016 -with a variety of fun activations and photo opportunities to ensure Music Runners™ have a rocking good time.The Music Village Gates open at 3.30PM –and Music Runners™ will be treated to endless music and fitness-inspired entertainment in the Music Village. Getting the party started will be home-grown singer-songwriter Nathan Hartonowho will perform energetic pop jazz tunes on the main stage of The Music Run™ by AIA for the first time this year. Runners can also treat themselves to a slew of fun and exciting activities including bubble football, giant slideand aninflatable climbing wall. 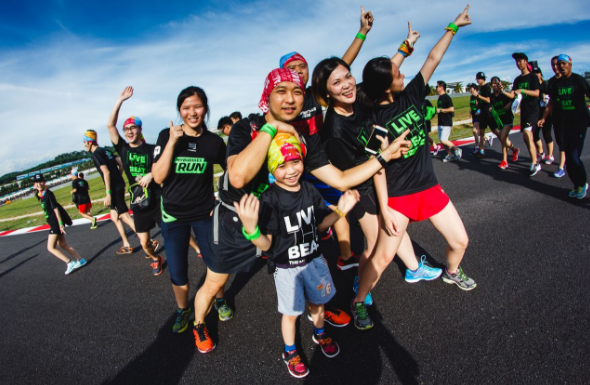 Presenting Sponsor AIA Singapore will host fun and challenging activities such as Plank Challenge, BlenderBikesanda Trampoline photo boothwith cool prizes to be won at the AIA Vitality Get Active zone atthe Music Village. Music Runners™can also try their hands at being a 1-min DJ or get a hydro-tattoo for free! In addition, AIA is adding a future-focused touch this year with the introduction of an Augmented Reality(AR) APP which allows Music Runners™to trigger AR filters by scanning special markers or signs in the [email protected] Village, AIA Rock Highway and AIA Electric Avenue. More surprises and rewards await runners from event partners –Music Runs can take part in music-themed competitions at the AirAsia booth, enjoy attractive discounts at the PUMA pop-up store and quench their thirst with Gong Cha bubble tea. Lucky Music Runners™can also stand a chance to win prizes sponsored by CREATIVE and PUMA! Music Runners™ will have a chance to stretch their muscles before the run with a mass Warm-Up session before proceeding onto the 5KM Soundtrack. The 5KM Sound TrackThe Sound Track™is a five km running course lined with over 120 speakers that pump out the songs Music Runners™ voted for across five different music zones. Each zone will feature cool activations and great photo opportunities for Music Runners™. 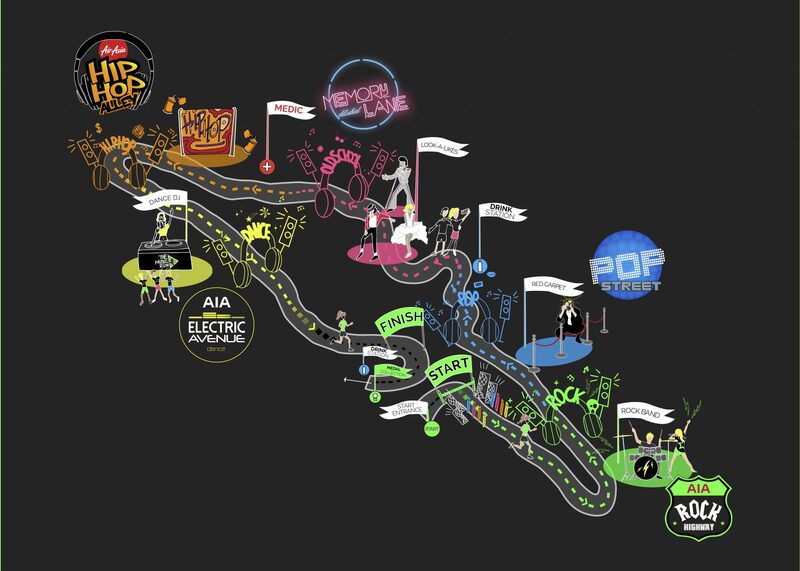 The first KM begins with the AIA Rock Highway which will feature a gigantic rock band display where everyone can be a rock star for the day. In the Pop Street, Music Runners™ will be treated to a“red carpet experience” along to the latest pop tunes. In the third KM, runners will be invited to take selfies with old school doppelgangers along Memory Lane, which plays old-school music that often draw cheers from everyone. AirAsia will provide surprises along the AirAsia Hip Hop Alley where only the smoothest R&B and hip hop beats reside. In the final KM, participants will be dancing along to electronic dance hits in the AIA Electric Avenue featuring a pop up disco tunnel and a live DJ in the air. All the songs that will be pumped out across the 5KM route will be selected by the Music Runners™ themselves through a bespoke voting app developed by Spotify on the official Singapore website. Music Runners can continue running to Spotify after the race. Official sponsor, Singtel, is offering Spotify Premium to Music Runners at an exclusive rate of just $1 for the first 3 months without any data charges on Singtel Music when they sign up for the run. The After Party Participants returning from their run will join the After Party featuring returning radio house DJ Sam Withers(Aus) who was a big hit in last year’s after-run event, who will be performing the hottest tunes of 2017 at the Ultimate Music Festival. 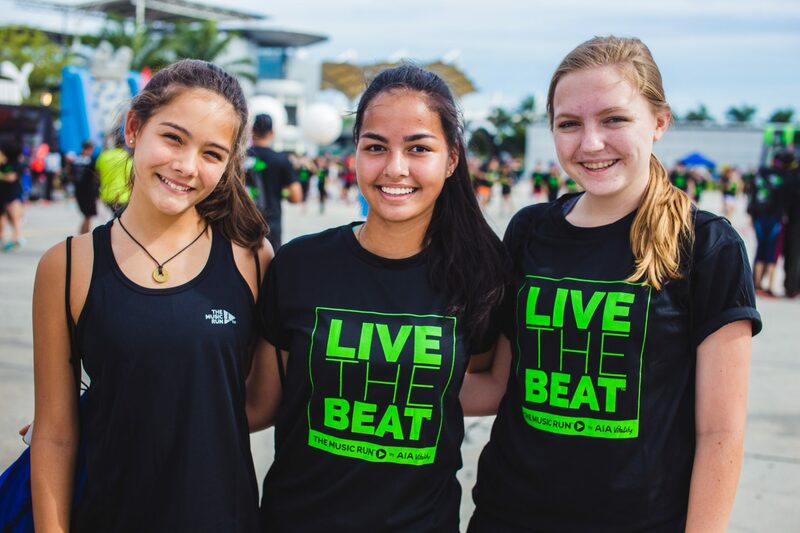 The Music Run™ has been bringing the beat since 2014, winning fans the world over from Texas to Bangkok. Since then, it has drawn more than 100,000 runners across 12 events and nine countries. Tickets start from SGD 60 and includes a T-shirt,Bag, Sticker, and Tattoos. Event pack collection is from 28-30 April between 10.30am-1 0.30pm at Capitol Piazza B2.